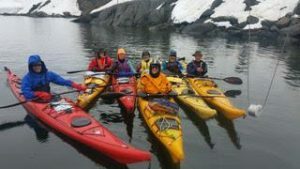 The BGLE 80th Anniversary Sea Kayak Expedition Antarctica 2017 – six Kiwis and one paddler from Tasmania. BGLE stands for the British Grahamland Expedition – 1934 – 1937. Expedition leader, the big Australian John Rymill, was a member of the Gino Watkin’s led British Arctic Air Route Expedition (1930-31) and it was John who took over leadership of the following East Greenland expedition (1932-33) to Lake Fjord when sadly Gino died on 20 August 1932 whilst out seal hunting. 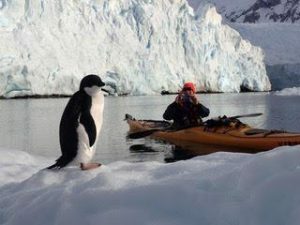 The BGLE was an ambitious expedition to the unmapped areas of the Antarctic Peninsula, using much of the aerial survey and ice travel (dog teams) expertise than John had learned from his two East Greenland expeditions. The three year expedition was (in my view) the most successful of the pioneering exploration expeditions – no one died heroically, and so much was achieved. Our March 2017 expedition marked the 80th anniversary of when the BGLE was completed. 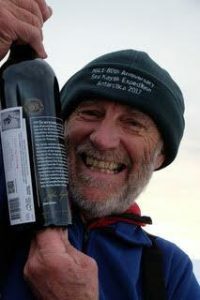 Rymill wines from South Australia had kindly provided a special bottle of the family Shiraz to be drunk at the old northern base of BGLE when the paddlers finally arrived there.